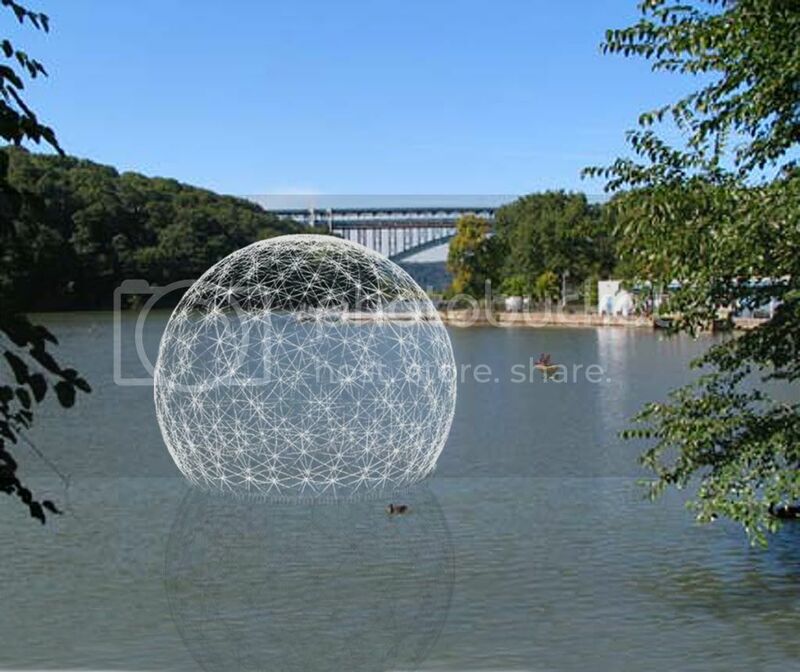 Please help us realize Harvest Dome 2.0, a floating installation for the Inwood Hill Park Inlet that calls attention to New York City’s waterways and watersheds. Working with Inwood teens and architecture interns from around the city, we are gathering seasonally discarded storm-snapped umbrellas, and assembling them into a giant twenty-four-foot diameter, light-gauge spherical dome as a physical revelation of the city’s accumulated waterborne debris. The Inlet, Manhattan Island's last remaining Saltmarsh, is a remnant of Spuyten Duyvil Creek’s marshland, reconfigured and dredged in 1895 to create the Harlem River Shipping Canal. It is home to saltwater cordgrass, a species particularly adept at trapping and converting flotsam into the nutrient-rich mud called detritus, which supports abundant life on the marsh. Twice during the course of each day, the buoyant sphere will rise and fall with the tide— alternating between floating on the dark water and sitting on the uncovered mud-flat. The Dome engages circadian rhythms of the water and emerges from the mud-flat as a curiously out-scaled harvesting of human-generated urban flotsam. 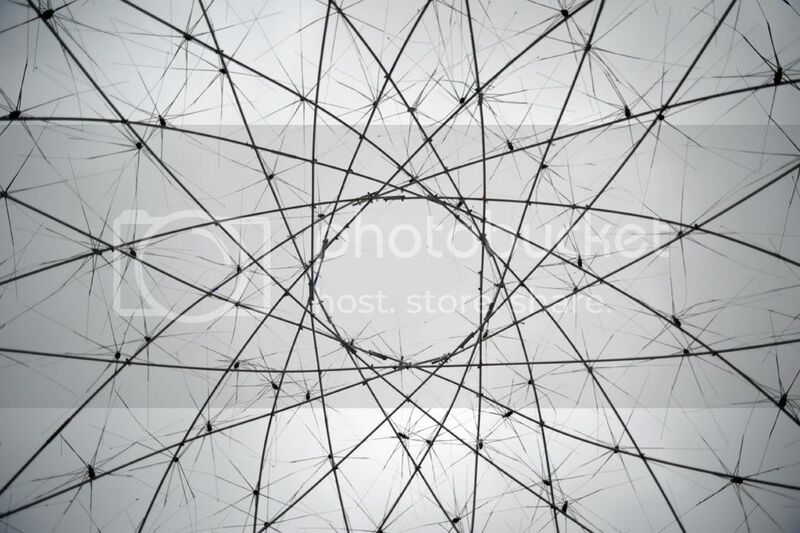 What was the first Harvest Dome? 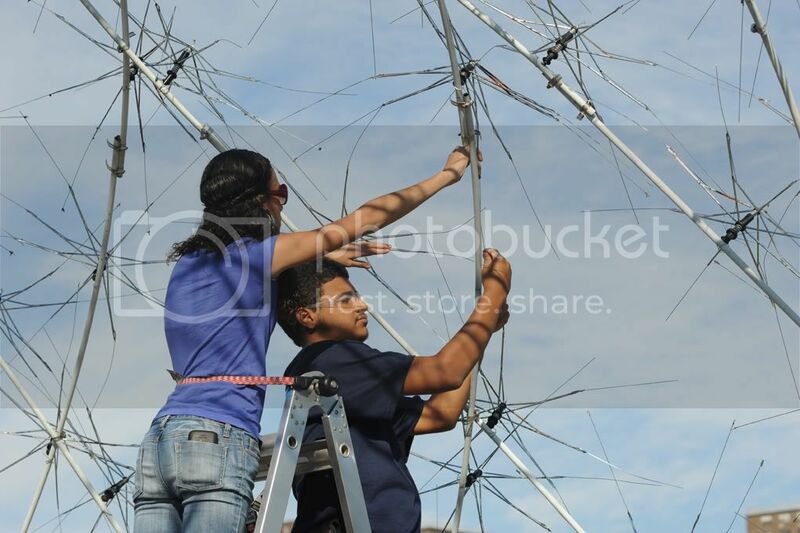 We built the first Harvest Dome during the summer of 2011 with a grant from the Lower Manhattan Cultural Council, at the outdoor patio of Rocking the Boat and The Point, a space shared by a boat-building program and community arts group in Hunts Point along the Bronx River. 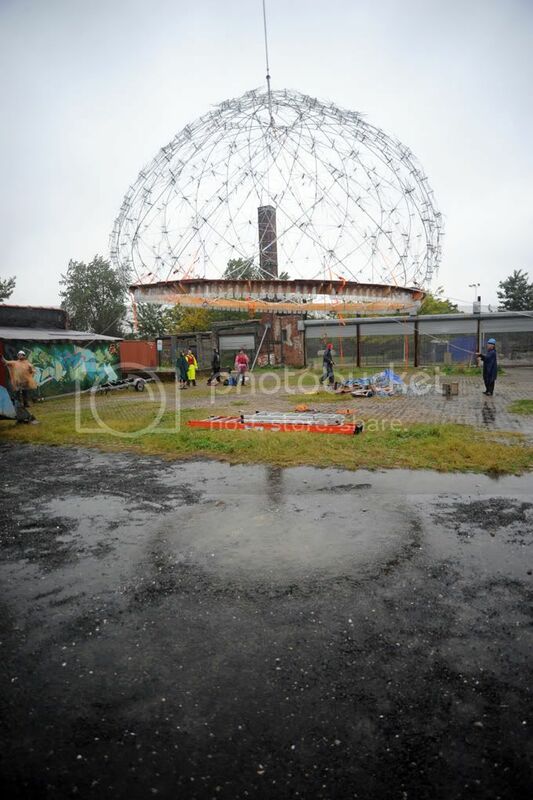 On October 19, 2011, we transported the dome on water from Hunts Point to the Inwood Hill Park Inlet with the help of Rocking the Boat and the Bronx River Alliance, but inclement weather caused the Dome to be marooned against Rikers Island. The dome was then requisitioned and destroyed by the New York City Department of Correction. SIMS Metal Management in the Bronx volunteered their services to hoist the Dome out of the patio where we were working and place it into the Bronx River for its trip to Inwood. On November 11, 2011 we salvaged the destroyed remains from Rikers Island and will display them alongside Harvest Dome 2.0. We are giving out limited pieces of the salvaged Dome as Kickstarter rewards after they go on exhibit. We need your support to ensure that we can rebuild the Dome--even better this time! Harvest Dome 2.0 will introduce light into the work, and have an array of light-emitting-diodes, inserted into each of the bottles and powered by tiny photovoltaic cells to create a glowing halo in the water at night. We are currently working with groups local along the Harlem River to secure a location to construct the Dome nearer Inwood Hill Park, with an anticipated exhibition date for August 2012. NYC Department of Park and Recreation has already obtained permission for us to put the Dome in the inlet waters. All donations are greatly welcomed, and will go towards the construction and permitting costs for floating the Dome at Inwood Hill Park. Now we need to make our minimum goal of $7500. If we don't reach this goal, then Kickstarter does not release any funds to us. Thank you! We look forward to making this project a reality. Site Credits: Video - Chris Kannen; Photos, Andreas Symietz.